This is the flag that is dyed on the date of departure. 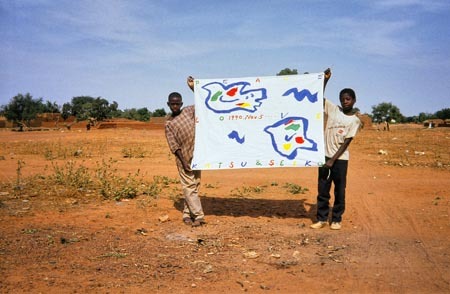 It is pleasant to think that with this flag people can communicate even though there is a language barrier between them. You can even see the imagination in the flag in this photo. In addition, the flag is only a simple fabric. The flag can be used in the daytime to block strong sunshine that comes through the roof, in the night as a blanket to keep from getting cold, or as a Furoshiki (Japanese style wrapping fabric like a kerchief) to wrap your many gifts when you return home.